Is my Cracked Windshield still Safe to Drive? Damaged Auto Glass or Cracked Windshield? Windshield cracks are a pain to deal with. Damaged windshields are a major safety issue; but some drivers attempt to keep driving, for as long as they can, before they pay to have their damaged windshield repaired. Our experts at Advanced Auto Glass are here to help you. 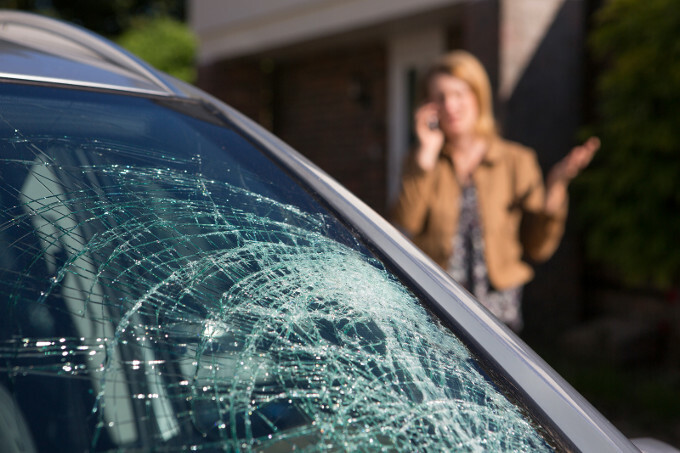 One of our main goals is keeping drivers in our community safe, so read on to learn more about windshield glass safety. We know you’re a smart automobile owner, but a little learning never hurt anybody! So, seriously, how long can I keep driving with a cracked windshield? The serious answer really is the only answer. Get it fixed right away. Even a small rock chip in your car’s glass can begin to grow, the longer you drive without repairing it. Another factor is weather; if heavy rain, wind-blown debris, or anything with force behind it hits the crack, your windshield could break right open, exposing you and your loved ones to potential injury. So, if you want the best, most effective solution instead of the wait-and-see approach, check out the following points to examine…. A minor chip is not a major risk. It might wait hundreds of miles until it begins to spread. But, large cracks that spread tentacles or look like spider webs need to be fixed immediately. These are the most severe types of cracks. If the crack obstructs any angle of the driver’s view from the driver’s seat, no one should drive the vehicle until the crack is repaired. Mobile windshield repair professionals exist for exactly this reason. When you cannot safely drive to a repair shop, they come to you, and get your windshield shiny and new within a few hours. So, if it can’t wait, what kind of hit is my wallet going to take? This is honestly the main reason why drivers wait and put off repairing windshield cracks. However, auto glass services are exactly like any other automotive services. The longer it waits before it is repaired, the more it costs when you eventually do get it repaired. So, getting the small crack fixed now costs less altogether than a full windshield replacement in a couple of months. Depending on the type of auto insurance policy you have, your needed auto glass repair services may be covered under your policy. What would it hurt to check into it? You may not have to pay anything out of pocket to get the windshield repairs you need, today! Who are you going to call for Cracked Windshield? Because you are such a smart car owner, you know that the best auto glass repair company is right here in our Dallas Fort Worth area! Advanced Auto Glass is here to help with your auto glass needs as soon as you give us a call! What are you waiting for? Your car may be able to park itself, but your phone won’t dial if you don’t pick it up first!